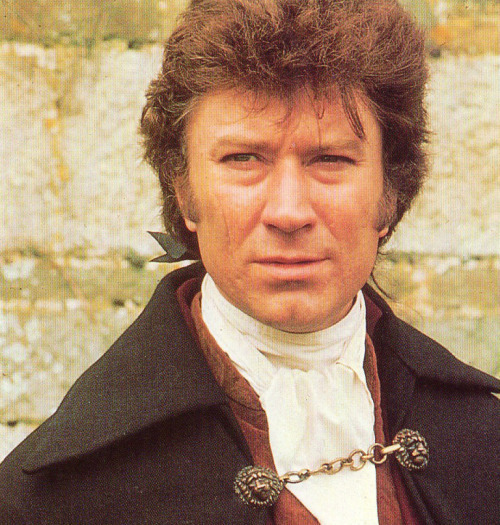 Robin Ellis, TV's original Ross Poldark, became famous back in the 1970s when Poldark was such a draw on a Sunday evening, it is said that church service times were changed to allow people to watch it. Nowadays, Robin lives in France with his wife Meredith Wheeler and enjoys a second career as a cook and writer of cookbooks. 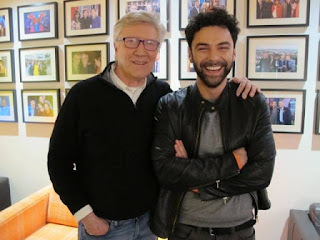 Two years ago, news that he would join the new adaptation of Poldark as the Reverend Halse was greeted with delight by fans everywhere and has certainly proved a popular move. I met Robin recently at a book signing for his latest cook book Mediterranean Cooking for Diabetics. 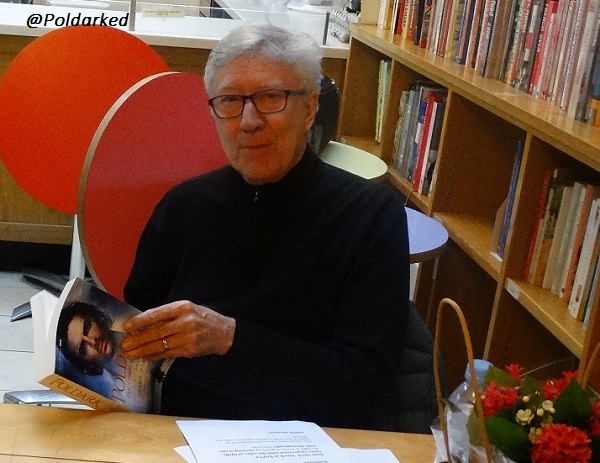 It's easy to see why he has a host of loyal fans as he is quite charming and I was delighted when he graciously agreed to an interview with Poldarked. 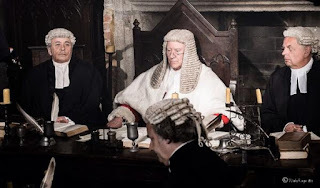 Poldarked: Poldark was phenomenally popular in the 1970s and the new adaptation has done well too. Why do you think this is? Robin Ellis: He was a very good storyteller, Winston Graham. They're classic stories and the books still hold up, the stories still hold up, the characters still hold up. Forty years later, it was well worth going with it again. 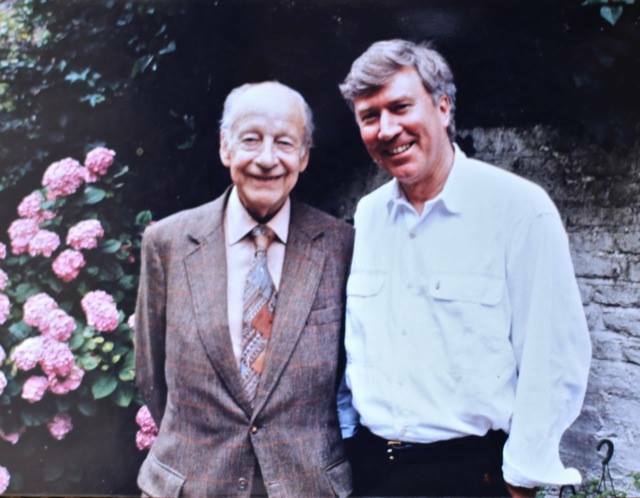 P: Andrew Graham is an adviser on the new Poldark but Winston Graham was obviously around when you played Ross. How involved was he in the 1970s version? RE: Well, he wasn't involved in the first series: in fact he didn't really approve at all, of the adaptation of the first book, in terms of Demelza's development - not Angharad's performance - because he felt that the adaptor had in some way misrepresented his creation of Demelza. I think he was sensitive to this because, although he denied this, to some degree the character was inspired by his wife Jean. He first met Jean when she was thirteen and I think Ross first meets Demelza when she was thirteen, so there are similarities. I think he was quite distressed when he first saw the adaptation and he tried to stop the series going out, I'm told: I never really talked to him about this. We got to know him thanks to Clive Francis, who played Francis in the first series. He met Winston at their club and said, 'We're filming and we didn't see you for the whole of the first series and this is quite wrong. We'd love to see you.' And as a result of that meeting, Winston and Jean became very regular visitors to the set both in Cornwall and at Pebble Mill where we did the interiors for the second series and they became our friends. They both appeared as extras and were really enthusiastic about the whole thing. He was very active: he still had five books to write. He was very alive and interested and became great friends with the cast. P: Have you read the later books? RE: I think I read numbers eight and nine. I did read his final book, which he wrote at the age of 92, Bella Poldark. It's tremendous! In fact I sort of thought he fell in love again with his female lead, Ross's daughter Bella, in the same way he fell for Demelza. He loved his characters and that was one of the reasons that he didn't want to do a third series based on story lines that he would write: he felt too loyal to his characters. The characters, he felt, had a life of their own and would develop as he wrote the books, which indeed they did, so he didn't want to hand the characters over to scriptwriters. P: When did you first learn they were doing a new adaptation of Poldark and how did you feel about it? RE: Well, I suppose I read it. I emailed the production company Mammoth [Screen] with congratulations and just said, 'Well done! What great news! Great stories, great characters, it's really worth doing again after 40 years,' because that was the way I felt. These characters are classical characters, great stories and they should be shared again. P: When you were offered a part in the new Poldark, were you given a choice of role? RE: They took me out to lunch and said, 'Who would you like to play? I didn't say Ross! I didn't know. After 40 years my in-depth knowledge was a little sketchy. So I said, 'Basically, I'd like to be in it: over to you as to what I might play.' And after a long gap of six to eight months they came back with the idea of me playing this disgraceful judge! P: Did Debbie Horsfield write the part with you in mind? RE: The Reverend Halse is a character in the books. He's not quite as defined as she has defined him because, in the book, I think that trial scene has three judges, of which my character is one but not the principal. P: What was it like meeting the new cast for the first time? RE: Well it was wonderful! What can I say? They're all good actors, well cast and committed to the work. When you get something as good as Poldark in its origin, it's good to discover that the people who are going to participate in it again have its best interest at heart. They were keen to make a very good job of it - both the actors and the production company - and that's what they've done. P: When it came to filming, did you find things were very different from the 1970s? RE: I did - yes. When we did it we did a lot of exterior filming in Cornwall but then we came back to London and rehearsed each episode for six days and went into the studio for two days. We filmed it eventually at the end of the second day, rather like a play. We started at 7.30 in the evening of the second day and we ended at 10.00. And the filming bits that we'd done, which were usually about ten minutes of the whole 54, were then slotted in afterwards. This time, absolutely no rehearsal. You come on to the set and you set the scene and the cameras come in and they light it and then you start doing it, basically. It was a bit scary at first! I got lucky with filming the first scene, in that the camera went on Aidan first and then reversed on to me, so we did the scene maybe five or six times on Aidan and I was able to run the lines and get used to the whole atmosphere before they turned the camera onto me. I think probably the director did that deliberately, knowing that I hadn't done anything for a bit and that it was all rather new to me. P: What was it like playing Reverend Halse in that court scene? RE: When you do something you get very immersed in it and, the fact that I'd played Ross's part forty years ago didn't really impinge on me at all. I was was fully engaged in what I was doing. When I was at Stratford in 1976 we might do The Comedy of Errors in the afternoon and King Lear in the evening, so one gets used to immersing oneself in an atmosphere of the thing pretty quickly really and that atmosphere takes over and helps your concentration. P: Has playing the Reverend Halse whetted your appetite for doing more acting again? RE: Well I think it has really. I very much enjoyed it. We live in France and to do theatre in UK is not really an option for me now, but if somebody offered me something in television or film I certainly wouldn't immediately turn it down. P: Did you get the chance to socialise much with the rest of the cast? RE: That is another difference, actually! What was wonderful about our go round was that we were meeting all the time, to rehearse and then to film and so we saw a lot of each other and we became a bit of a family. That's not quite the same now. People come in for their filming day and then they leave. And, although they might be staying in the same hotel, it's quite pressured and they don't really feel like doing the same kind of socialising, possibly, we did - although I haven't been to Cornwall so maybe they do the same sort of thing we did, down in Cornwall. That said, I went for the read through for the second series and the feeling in the room of the company that had done the first eight episodes was palpable. Everybody got on terribly well, were very pleased to see each other again. Clearly there was a family feeling there as well. P: Aidan's horse Seamus has become a star in his own right. How did you get on with your horse when you played Ross? RE: Dennis, the first horse, was a star anyway. He was a twelve year old steeple-chaser and you couldn't teach him anything. He knew it all! He threw me twice. But we got on pretty well really. I seem to remember watching the early episodes and I swear he smiled at the camera as he went through. My second horse, Ebony, was very experienced and extremely strong-willed. They taught me how to ride, in a way, as I'm not a rider. I only ride for money, basically! But I got on well with both horses in the end. P: You and your wife, Meredith Wheeler, seem very much a team. Does she help you prepare for your role? RE: She runs the lines, she always has done. There was a lovely moment filming the first scene that we do. There was a pause in the filming and she was outside having a coffee when Aidan came out. He was running the lines to himself and she thought, 'I won't interrupt him because, clearly, his concentration is important to him.' Then he, I suppose feeling somewhat self-conscious, said 'I've got to do this right,' and she said, 'Well, yes, I understand. I know this scene very well. I've played you! I know every word you say!' Because before filming she'd run the lines so many times, playing Ross, that she could almost run them without the script. P: Without giving too much away, is there anything you can tell us about the Rev. 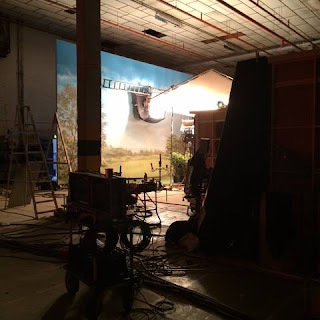 Halse in Series Two? RE: I do three scenes. They're all courtroom scenes: two with Ross and one with Francis and Dwight Enys. They're all good scenes. I enjoyed playing them all. P: Do you think we'll ever see Halse smile? RE: Ahhh! Well I did smirk a little in the card room scene. If you watch very closely you'll see a rather complacent smile come on my face at one point. But any opportunity to be amused at somebody else's discomfort would be great! P: And will we see the Reverend Halse in Series Three? RE: Series Three? Well, it's not been confirmed yet so I don't honestly know about that. One lives in hope! Many thanks to Robin for this interview. I enjoyed talking to him tremendously. 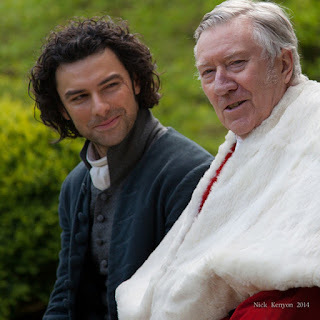 Robin's memoir Making Poldark has been updated to include filming the new series. Robin is delivering the du Maurier Lecture at the Fowey Festival on Saturday 7 May, 2016. 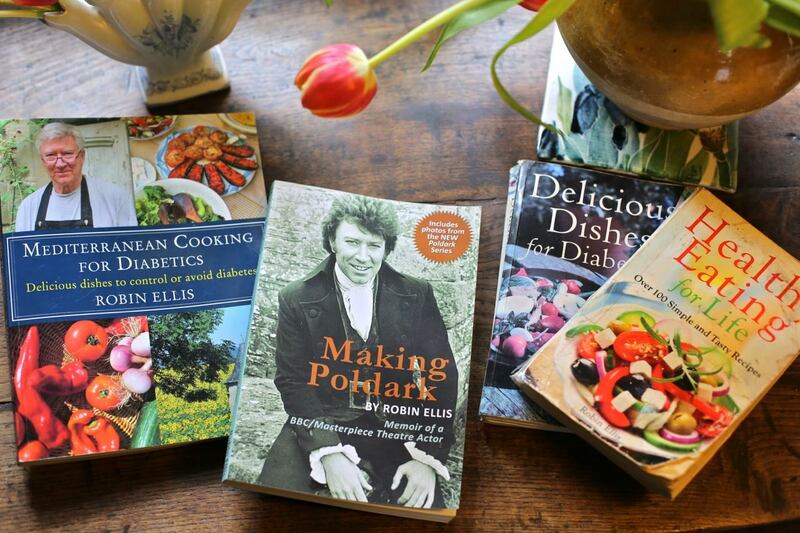 On Sunday 8 May at 2pm he is giving a book talk and signing for his new cookbook Mediterranean Cooking for Diabetics, again at the Fowey Festival. He will be doing a free book event for Mediterranean Cooking for Diabetics at Waterstones in Doncaster on Thursday 16 June at 6.30 pm and a similar event (talk, Q&A and signing) at Waterstones in Sheffield on 17 June (time tba). Robin also runs cookery workshops in his village in southwestern France.